In the weeks that followed my leaving my newspaper reporter job in 2009, I spent a lot of time at the movies. 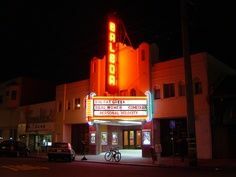 Having practically grown up in neighborhood single screens in San Francisco, I always gravitated to red velvet chairs and dark theaters when life was a little overwhelming. I had left my job of a decade and I was toying with the idea of writing a book. As I often do, I tucked a notebook in my purse. As a few other daytime movie fans chatted while waiting for the previews to commence, I grabbed my pen and pad and started to map out a book about surviving toxic moms. I had an idea of what stories from my life could serve as a foundation and I made a list of women I knew that I could interview on the topic. At the other end of my row two grandmotherly women were chatting and laughing. One turned to me and asked if I was trying to get homework done before the show. “What would you write about?” a lady named Doris asked me. “I know a lot about surviving toxic, terrible mothers. I think I’ll write a half memoir, half interviews with other resources, self-help kind of book,” I said. Then they BOTH leaned towards me, and burst out laughing. One said she had the meanest mother ever – that SHE should write that book. The other said she would buy my book and would buy copies for some friends. I could see that they totally “got it.” They were the very first Toxic Mom Toolkit fans – before I even had a title, a blog or a Facebook page. The lights dimmed and I tucked my notepad into my purse and enjoyed the movie. The theater filled up and I lost a line of sight to the encouraging senior ladies. But as I was walking out after the movie, I felt a tap on my shoulder. 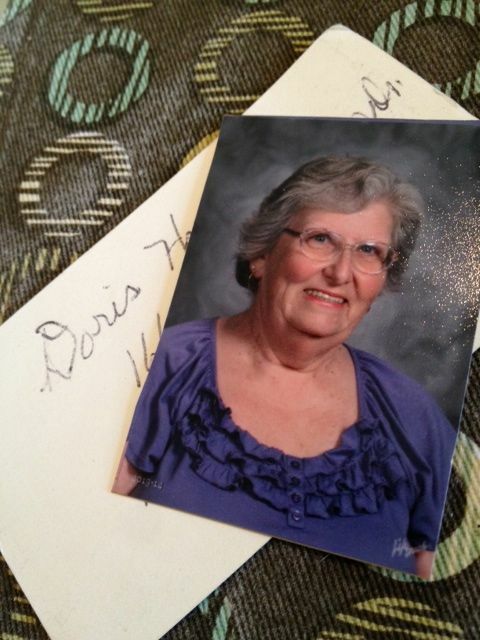 It was Doris handing me a card with her name, address and phone number scribbled on the back. Two days ago, I received a huge box containing 50 copies of Toxic Mom Toolkit meant for family and friends. All of a sudden, I wanted to find Doris’ card from years ago. I kept it tucked into my computer case and often thought of her early encouragement. It was like her immediate buy-in opened a floodgate of encouragement at every step of the book writing effort. I checked the address and realized that her home is about 10 minutes from my home, so I grabbed a warm scarf and my car keys and drove over. When I rang the bell, the house erupted in small dog barkiness and I heard Doris shushing a pack of tiny terriers. I held the card up to the locked screen door with one hand and held my book and business card in the other hand. “Oh, HONEY, you did it. Do you know that I’ve told that story about our meeting in the movies so many times and I’ve always prayed that you would get your book done. Look at that! Isn’t that amazing?” she said as she hugged me. 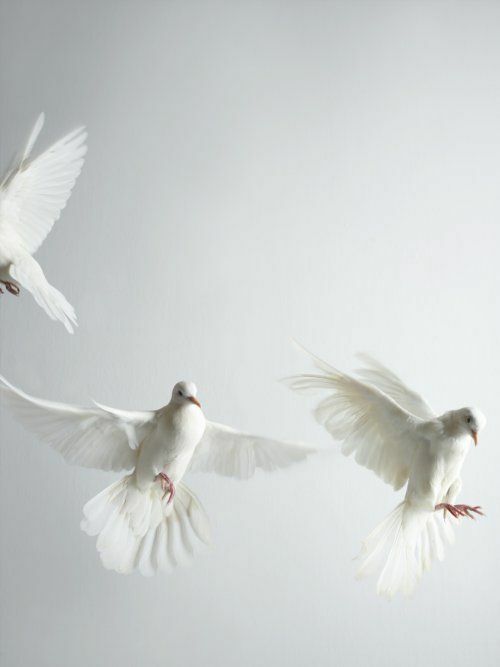 As I often do when overwhelmed by emotions, I fled at the first opportunity. I drove away and no sooner had I turned the corner, she called me on my cell and asked me to come back and sign her book. While I was re-parking she went back in her house to get something for me. “I volunteer at the school, so they include us in school pictures,” she explained as she handed me one of her photos as a momento. I thanked her again for encouraging me and told her that her prayer must be powerful. I suggested she keep praying for as many people as she can. We both got a little choked up. “Wow, that felt good,” I said to myself as I drove back home. One night I was curled up on my couch with a book and my little old dog in my lap when my cell phone erupted.The caller I.D. simply gave what looked like 20 odd numbers in neon digits. Feeling brave I clicked through and man with a charming French accent explained that he was calling Rayne, the founder of Tox-eek Mom Tool-keet — from Paris. He was quite concerned about a younger sibling living in the United States. It seemed that their toxic mother created such severe drama that there was concern for the well being of his brother. Of course, I was concerned too. Concerned he had my private cell phone number. I had to ask him where he got it. “It’s there on your website, really. I didn’t do anything bad to find it, but if you go back into how you set up your page, it’s there,” he explained earnestly. He went on to say that he was so relieved to find something on the Internet that seemed to address the exact problem he was worried about. He calculated the difference between time zones and he crossed his fingers that I’d be home in the evening after dinner time. Which got me thinking of how many thousands of newspaper articles I’ve written that included my desk number and, who knows, might have linked to my cell phone. Does it really matter? We had a long chat. He was so grateful to just have a sounding board. I offered some suggestions and we collaboratively created a short list of helpful things that could be done immediately. Before I hung up I complimented him on the obvious love and concern he had for his brother. It was really sweet. I made him blush. Regular followers of Toxic Mom Toolkit on Facebook know that I tend to post first thing in the morning before I head out for my day’s activities. Quite often, “friends” who can “see” I’m online send instant messages in the lower right hand corner of my computer screen. Usually, they are messages of thanks or updates on particular toxic mom situations. Sometimes they make me laugh. Sometimes they require that we chit-chat electronically back and forth for a few minutes. I’m always happy to make myself available that way. People have asked me to Skype and that’s where I draw the line. Only because women of a certain age who look like me should never Skype unless they own a Judy Jetson mask. It seems more and more often the stars align for these long distance conversations and my phone rings in Northern California and I put down laundry I’m folding. It doesn’t hurt that my journalism career taught me to shut up and listen. Or that I’ve collected hundreds of life stories and conducted years of interviews on the topic of surviving toxic moms. Five years as a law enforcement chaplain trained me to accept everyone without that impulse to fix anything. Like you even can. Listening. Hearing. Repeating. Agreeing. Suggesting. Offering similar tales from others. Encouraging. That, I can do. 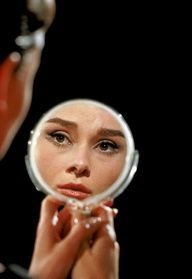 One sunny morning there was a call from a young woman, very upset at the sudden realization that for her entire life her mother had made it her business to be cold and unkind – but only to her and only in private. She offered many examples and stressed that the worst venom was always delivered in private. How could a mother single out a child to abuse, she asked over and over. Could it possibly be true that her mother would never accept her in a loving manner no matter how many kind gestures the adult daughter offered? The telephone line hissed and crackled as we spoke and I stretched out on our guest bed, looking at the ceiling imagining the cell phone waves rising up out of my 1970’s ranch home to a space satellite and blinking back down into an ancient city built on the pearl trade and sustained in modern times by oil. Was I really helping someone in the Middle East? Yes, I was. These calls boggle my mind. How can one person at their kitchen table be able to calm and encourage someone half-way across the globe? I guess it helps if you are earnest and honest and can identify with all the confusion and hurt and sadness. That I am upbeat and encouraging makes others brave. I know after we hang up, the callers go back to the Toxic Mom Toolkit Facebook page and they read, read, read. I see them lurking in the stats. A few from the island of Mauritius. That nice lady in northern England. My friends in southern Italy. The writer in Iceland. Every story of crisis and the lines of support from other people create a platform for examining their own mother/son/daughter relationships. Is the passive aggressive mother in the deep south so different from the angry alcoholic mother in Central America? Are personal boundaries as necessary in Peru as in Poland? Visitors from different continents and countries, speaking different languages, all wade in like gold miners swishing the stories around in a shallow pan looking for that nugget that will help them find peace, or at least a visit home without a screaming match. Callers may not always find exactly what they want in that moment but they do discover that they are not alone. They see that it took many, many people to create such a wealth of helpful information and resources and that they, too, can contribute. They gain perspective and start viewing their family story as a story. And then, if they are lucky, they decide to be the hero of that story. Here is a sneak peek at a chapter from Toxic Mom Toolkit. The book is finished and I am beginning the process of figuring out how to get it published. Jen and I were having our monthly eggs Benedict brunch (my eggs hard as golf balls, hers not so much) when she asked me what I’d do if I won the lottery. The newspaper headlines were trumpeting a huge jackpot. I happen to have given this a lot of thought. 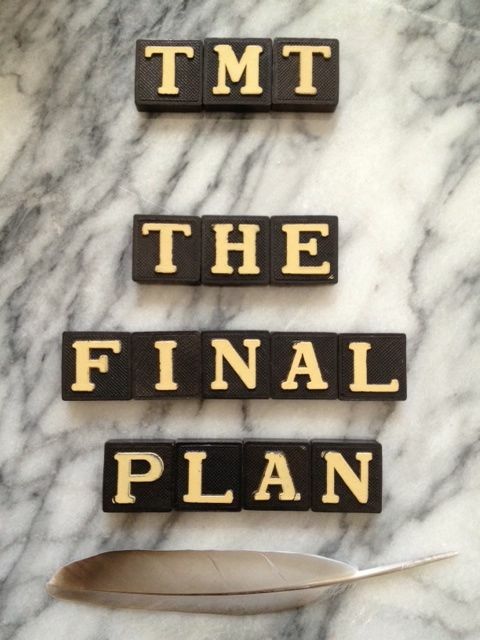 I’ve even written out my “to do” list, should my winning numbers come up. In previous daydreams I had concluded that it all comes down to world travel. Say you win $100 million. First you pay your bills, and then you pay the bills of those you love. Then you buy a house or two and have some shared experiences with loved ones to recall with a sigh when you’re old and in a wheelchair. But after that shower of riches, it really boils down to the ability to go see whatever you want. The Vatican on Easter Sunday? Amen. Front row seats at the Paris Opera, gazing at the shimmering Aurora Borealis in Norway or the running of the bulls in Pamplona? Jen agreed I had a point. So where would I go with my Lotto winnings she wanted to know. 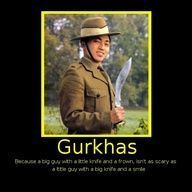 Nepalese Gurkha’s have fought alongside the British for hundreds of years and are considered among the bravest and most loyal fighting men on earth. When they retire from military service many work as bodyguards or house managers to those with security concerns, I explained as I tested the denseness of my egg yolk. As a fellow undutiful daughter she knew that any story blurted out like that certainly had something to do with my toxic mother. When I was little and the doorbell rang at our San Francisco flat my mother would grab me from behind – one arm around my tiny waist and the other over my mouth – and clutch me to her own chest, dragging me backwards to the hall coat closet. She’d inch deeper into the space quieter than a cat to hunch in a corner behind the second-hand vacuum cleaner. Is there anything worse than seeing nothing when your eyes are wide open in fear? With our faces smushed against musty woolen coats we’d wait until the coast was clear. Yeah, I know. Who’s mother does this even once? As an adult I can guess she was afraid of something. Was the rent overdue? Was my mother avoiding man complications? Was it the truant officer? But I do know for the little kid who still resides in my brain: Nothing is scarier than a doorbell. Learning that I was carrying around my mother’s inexplicable fear of door bells he devised a regime of nearly constant random doorbell ringing and timed me on my responses. He briefed and encouraged neighbors and friends to pop in as often as possible. What started as a two- to three-minute ordeal of looking out windows, through peepholes and smelling the crack for danger was whittled down to one super charged moment of dread as I flung open our front door expecting to be impaled with a rusty pitchfork. Yes, he successfully desensitized me but truth be told, I’d still pay someone to greet visitors. 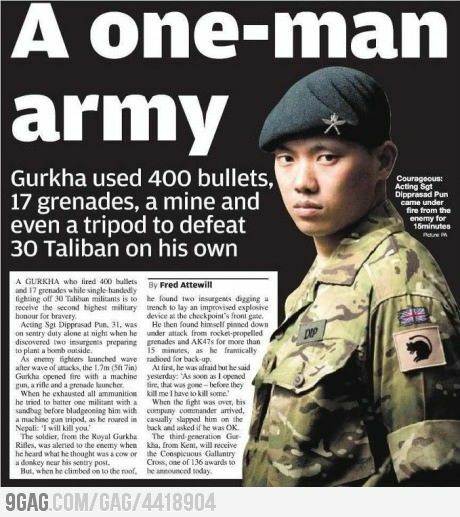 Lotto gods willing, some day I’ll hire my own Gurkha. You never know, one day it could be my birth mother on my stoop and I’ll be glad there’s a hired killer in my employ between us. Feel that limiting contact or cutting off contact with their Toxic Mothers will somehow reflect badly on them. They worry that others will wonder what’s wrong with them if they can’t even maintain a relationship with their own mothers. Hold onto the hope that their Toxic Mothers could “get better” or suddenly become more loving towards them. Fear retaliation from their mothers for limiting or cutting off contact that could include being barred from family activities and holidays. Figure that even a negative relationship is better than no relationship at all. Maintain contact in order to monitor younger siblings and intervene when necessary. See their bad relationship with their Toxic Mothers as the only conduit to a father they still love dearly. Can’t let go of a shared history, even if it’s mostly negative. Hope that their Toxic Mothers might miraculously make wonderful grandmothers. Wonder deep down if their Toxic Mother’s aren’t right about them. Can’t see their Toxic Mothers simply as other adults. They can’t see their Toxic Mothers as people. And because they can’t judge their Toxic Mothers as they would any other adult they stay connected. I was sitting on a café patio with a good friend. We were enjoying iced teas on a hot day. This friend has been super supportive of my Toxic Mom Toolkit work and has had periods in her life when she felt her own mom was toxic. The good news for my friend is that lately she has been able to enjoy time with her mother. That has happened because my friend set up some boundaries and has learned to say “No” to her mother. She’s been amazed at how quickly her mother has adjusted to her wishes. She’s very grateful that there are nice telephone conversations and pleasant outings now with her mom. As I was listening to my friend the best analogy for this lack of true love feeling so many daughters of toxic moms experience, which can include feelings of confusion, yearning, and pain – suddenly, hit me. You are invited to a famous fancy country club. They have all these signature dishes and drinks. Let’s say, this club invented the Bloody Mary cocktail. So, you’re thinking everything I order here is going to be fantastic: over the top. Sort of like mother’s love, which is unconditional and all encompassing. You take your seat at a table overlooking a sweeping bright green lawn. The birds are chirping softly. Silverware being used at other tables creates a soft sonata of happy clinks. You decide to order the famous club sandwich and the Bloody Mary. You envision perfectly toasted thin sliced bread with lettuce, turkey, bacon and just the right slather of freshly made lemon mayonnaise. Your order arrives on a gleaming gold-rimmed plate and a chilled glass placed beside it. As you adjust your napkin under your chin you notice there’s not really a lot of bacon. Wait a minute. There’s NO bacon. 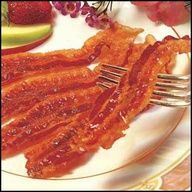 You look up and check other diner’s dishes and you see other people with the club sandwich have so much perfectly crispy bacon on their sandwiches that they are breaking off long pieces and using the stiff slices to stir their Bloody Mary’s! What is in your Bloody Mary glass? A used popsicle stick. You politely call the waiter over and point out that the kitchen forgot your bacon. And you need a proper Bloody Mary, please. He smiles and informs you that there was no mistake. 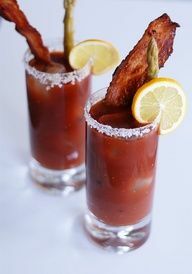 YOU don’t get bacon on your sandwich.YOU don’t get a bacon swizzle stick for your Bloody Mary. “You get a club sandwich with no bacon!” my friend chimed in as we both slapped our hands down on the table top. We laughed about bacon as a synonym for love and throughout the rest of our conversation when talking about hurtful things that her mother had done, we would pause and both say, “No bacon” and we understood each other exactly. If you want and deserve yummy, savory, bacon/love and know you’ll never get bacon/love from your Toxic Mom why do you keep ordering it? Why do you keep paying for it? Why do you keep walking away feeling totally gypped? How many times would you go back to that country club and order the club sandwich with the hope you’ll get bacon before you try another restaurant and actually get bacon? Yes, it won’t be the FANCY restaurant bacon, but there is wonderful, lovely, bacon elsewhere. There is bacon everywhere else. You can go out into the world and get all the bacon you deserve.